First up is this cute outfit. Let's talk about the top first. Oh I love this top! It is the Little Betty top pattern by my beautiful sewing friend Suz. Believe it or not, I had this pattern printed out last year. I cannot believe I have not made it until recently! There is something about this top that reminds me of my childhood. This top is perhaps the most luxurious item in my daughter's wardrobe. The grey and the pink are merino wool purchased from a remnant bin at the Fabric Store in Melbourne. The grey fabric is thicker than what the pattern suggests, but I figured if it worked for Tasha it would work for me too. I had to improvise with the neckline binding a little as my fabric was too thick. I simply did not fold the binding under on the wrong side of the top. It does not look as neat as it could have, but who is going to check? The ruffles are made from Liberty. I mean, why use anything else with merino? OK, the truth is I have only ever bought 30 cm of Liberty for this dress. I had to cut ruffle pieces cross grain so they would fit on a small piece of Liberty I had left. The only thing I altered was the back closure. The pattern offers a button and a loop closure. I thought I would winterify (totally a word) the top and sew in a zipper instead. 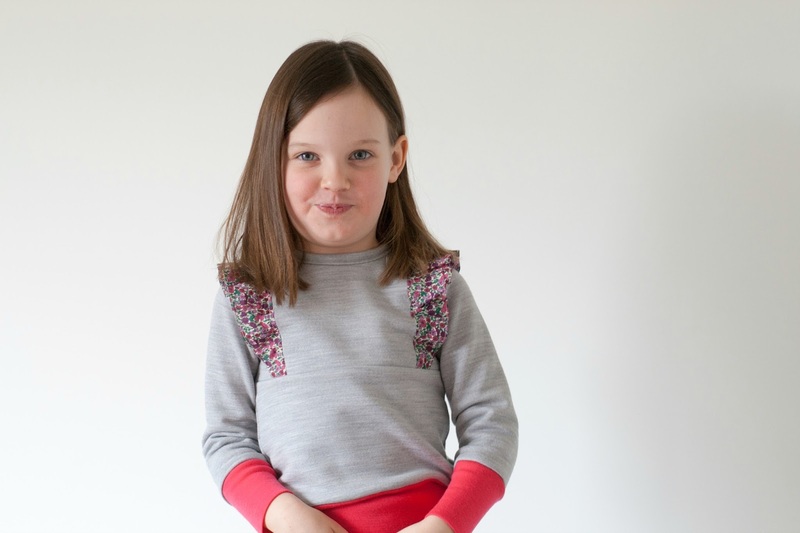 After sewing the Little Betty top I can say that I have sewn every single pattern by Sewpony Vintage. Just like with every other Suz's pattern I have sewn this one was a great experience to work with. Suz, I am looking forward to the release of your new pattern! A new top was practically begging for a pair of new pants. I used the Serendipity trousers and capris pattern again (see the first pair here, capris version here and one more pair on Instagram). 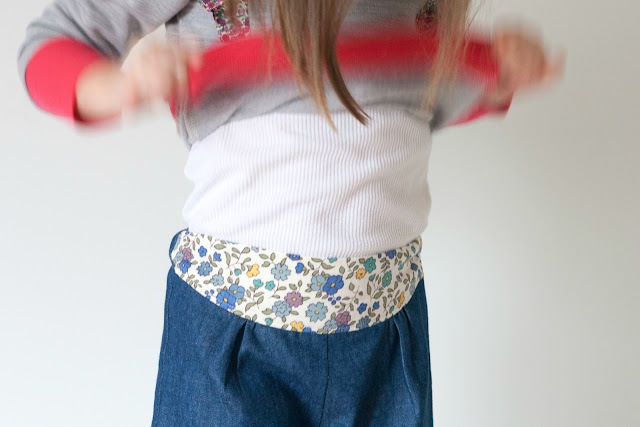 It is a great quick pattern to sew. I cut my first Staple dress to make these pants. I loved the dress but the neckline felt too wide and after a while I did not feel comfortable wearing it. The dress offered plenty of fabric to be recycled into a pair of pants for my daughter, so I did not feel guilty cutting into one of the first things I have ever made for myself. This time I decided to use contrasting fabric for the yoke. I just love the splash of colour, so does R.
A happy smile on R's cheeky face is the best reward for me. That and the fact she liked the newest additions to her wardrobe. So cute, Jenya! I love this entire outfit -- and how fancy of you to use Liberty <3 Those pants look super comfy and therefore great for running around in! Winterify is totally a word! We winterify everything here in Michigan :) The outfit is adorable! I love the addition of the zipper on the top. Thank you Celina :) This little outfit was so much fun to make! A gorgeous outfit Jen!! How are you blogging right now with a tiny bubba? amazing! 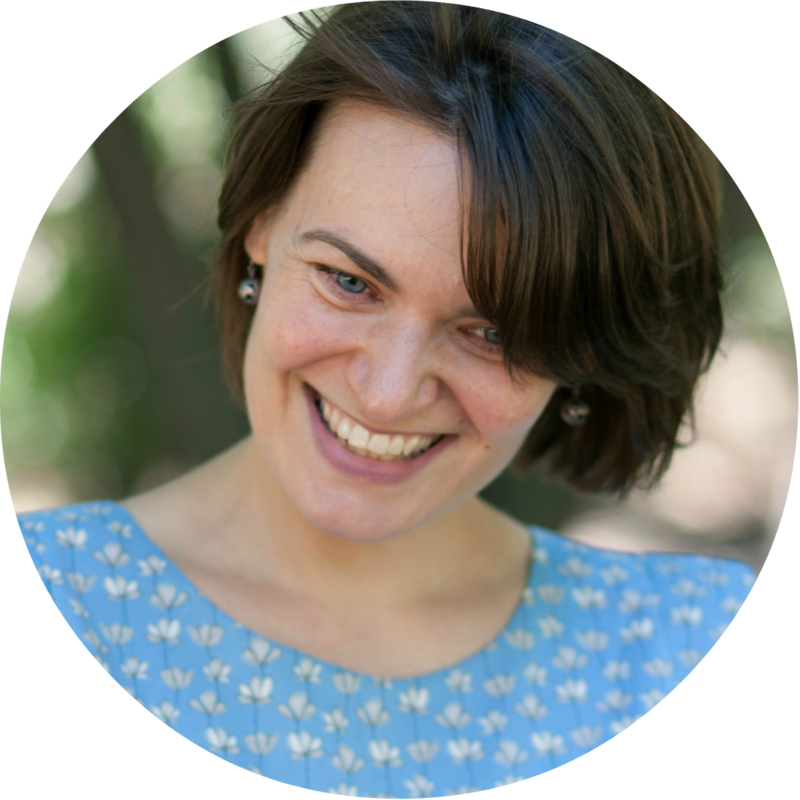 Thank you Renee :) Blogging with a newborn is trickier. I can't stay up at night anymore. Staying up is a challenge full stop at the moment as Pixie confuses day and night at times, but not too bad. She will start sleeping for longer periods of time eventually, so I will just try to squeeze a few minutes here and there. I bet it feels soooo cozy. It sure looks adorable. It is Angela! The inside of the top is so soft! An adorable outfit, Jenya!!! 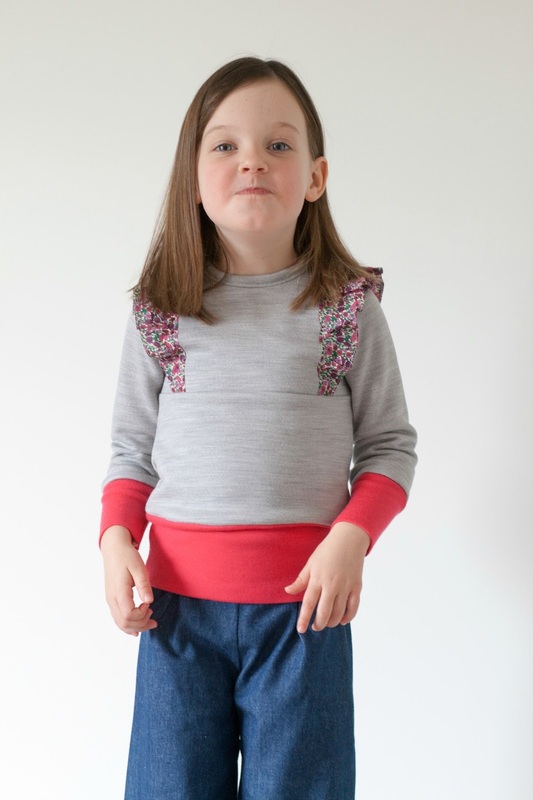 Merino wool and Liberty ruffles - awesome combo. Fabulous photos, too. Thank you Pam. I was so lucky to get that Merino at heavily discounted price. Gotta love remnant bins ;) LM likes taking pics on my sewing desk while playing with a balloon. Yes, a pink balloon is what made her smile and giggle. gorgeous Jenya!! R look so cute in her new outfit. I just love your little betty top!! Thank you Suz. It is a great pattern, thank you for sharing :) I would still like to make a dress version. What a gorgeous top! It is perfect with the adorable trousers too. I wish I could get my girls to wear trousers like that ... also I totally missed the arrival of your baby! Congratulations! Thank you Masha :) These trousers are super comfy. 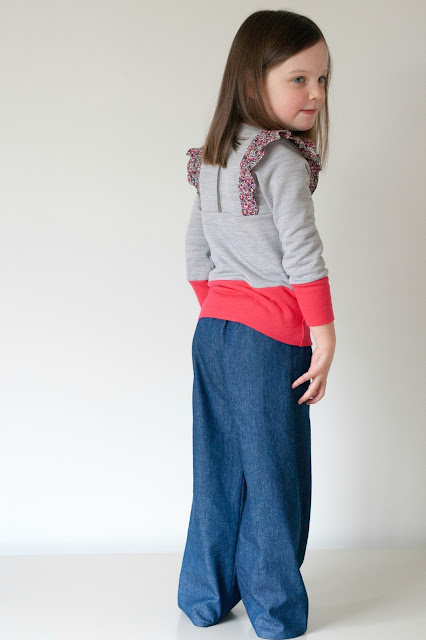 My daughter would not usually wear pants, but she likes these. I'm totally in love with this outfit! Gorgeous, especially the top! Beautiful. Jenya! Love the outfit and the pictures! Thank you Mie :) And I am SOOO jealous!!! What a great outfit! Makes me excited to do some fall sewing! Thank you Elizabeth. Yes there are some beautiful cooler weather things to be made! But now I am really looking forward to some summer sewing!! Oh, wow, I love this!!! The whole outfit has an awesome 70s vibe (I love a good 70s vibe, so this is a big compliment!) but your fabric choices are modern and spot on. I love the zipper in the back! Great idea and yes, winterifying is TOTALLY a word. According to me, anyway. Really like that top. Not sure about the seam going across the middle though, I suppose it's so that the ruffle can tuck in. Maybe an opportunity to colour block here. Hmm!! I like it. The zip looks fab. Colours, fabric all look great. I really don't need any more patterns, but this is tempting. Oh Olu, I so hear you about more patterns! Your new collection is not helping me in that department either ;) I don't mind the seam across the middle of the top. Yes, there are definitely colour blocking opportunities with Little Betty! When I first saw it I instantly imagined a dress made with this pattern. 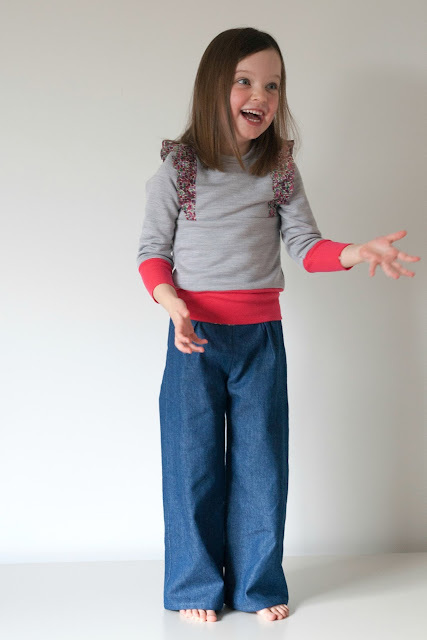 Have you seen dress versions that Trine from Groovy baby and mama made? They are fab! Ooh! I must check them out. Whatever she makes is fab. This is just awesome! I love the photos of her smiling! And the top is exquisite! You nailed it!